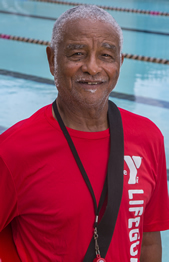 On November 4, 2015, at age 73, Elvin “Tampoo” Dalcourt swam – and won – a race that raised much needed funds for youth swim lessons in Baton Rouge. When word got out that he was going to race a man more than a dozen years younger, pledges started rolling in. $2 here. $5 there. In 24 hours, they had raised $1,400 to provide swimming lessons for kids who couldn’t afford them. The race, called simply “The Swimoff,” was so successful, it’s become an annual event. Tampoo has been swimming since he was 7 years old – since the Brooks Park swimming pool opened in 1949. He was the first kid in that pool. He didn’t yet know how to swim, but the lifeguards taught him. By 12, he was a junior lifeguard himself. By 14, a senior lifeguard. By 21, he was managing a pool, and swimming has been part of his life ever since. Those who know Tampoo know he’s a strong swimmer and a top-notch instructor. Although he swam competitively when he was younger, he says he’s a better swimmer today. Although he’s been teaching swimming since age 14, he says he’s a better teacher now, with more patience. Swimming keeps him young. Are swimming pools his fountains of youth? Maybe. It’s certainly clear that Tampoo doesn’t buy into that old myth that growing older means slowing down. At age 69, he did his first cliff dive in Costa Rica. Just this year in Orlando, he rode the 250-foot, near-free-fall skycoaster – not on a dare, but on a whim. And, at age 74, with boundless energy and enthusiasm, he volunteers almost daily to teach Baton Rouge children how to swim and be safe around water. As he shares his passion for swimming, Tampoo shatters myths about aging and shows that excellence comes through experience. Elvin “Tampoo” Dalcourt … Peoples Health Champion.